Did you feel that chill run up your spine? No, you didn't walk in front of the air conditioner. It's Friday the 13th also known in popular culture as the most unlucky day of the year. The curse of Friday the 13th is such a deep superstition that is has its own phobia (paraskevidekatriaphobia) and for huge parts of the Western world it's basically a death sentence. In fact, going through the Friday the 13th topic on Twitter would more or less confirm that. Not bad for something that only happens up to three times a year. However, as much as we mark Friday the 13th off on our calendars so we have a reason to expect the worst day ever, has anyone ever thought that celebrating it as a holiday might take away all of its sting? Think about it. It's just a day and it's just a number. The combination of the two doesn't make you any more or less likely to have a terrible time than you would have otherwise. Superstitions are usually a state of mind. If you want to take all the power away from Friday the 13th and put it back into your own hands, try celebrating today in any of these 13 ways. 1. Watch the Friday the 13th Films. Well, duh. If you want to be truly ironic, watching Friday the 13th on Friday the 13th would make you more meta than Abed Nadir from Community . 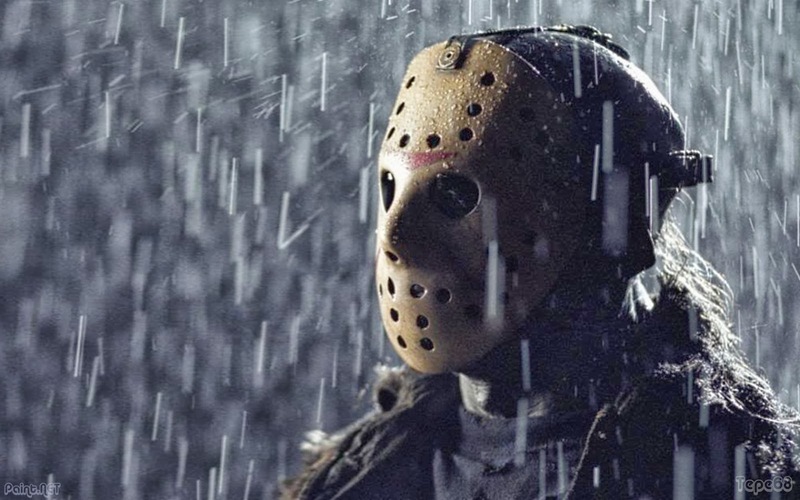 The film is about a group of teenagers who try to help reopen an abandoned campsite called Camp Crystal Lake and start getting killed off because, unbeknownst to them, that camp is the very same one at which Jason Voorhees drowned. Friday the 13th is also being adapted into a television series, so now's as good a time as any to catch up. 2. Adopt a black cat. Black cats have a rap almost as bad as the number 13. They're associated with witches and devil worship and having one cross your path is basically an invitation to start getting your will together and settling your final affairs. By adopting one, you're making their bad luck your own. I'm not saying you should train your cat to walk across the paths of your enemies, but it's an option. 3. Do a conga line under a row of ladders. To be fair, the reasons for not walking under an open ladder are more practical than simple superstition. After all, an open ladder usually indicates some kind of work being done up high and you don't want any tools or people falling on your head. However, for the purposes of your Friday the 13th celebration, the best way to show ladders you aren't afraid of them is to lead a conga line beneath them. Take that, superstition! 4. Knock over all the salt. According to popular legend, if you accidentally spill some salt then you're supposed to throw a pinch of it over your shoulder to negate the bad luck. However, if you've ever watched a single episode of Supernatural, then you know better than to waste salt like that. Preferably, if you're going to knock over all your salt, knock it over onto your window sills and over your doors. It will keep all the demons out. 5. Marathon the 13 Ghosts of Scooby Doo. Scooby Doo has ben on television in some incarnation more or less since it premiered in 1969. The 13 Ghosts of Scooby Doo was just one of those incarnations. It followed Shaggy, Daphne and Scooby Doo who have to capture 13 terrifying ghosts after they accidentally release them from the Chest of Demons. Probably because it had the number 13 in it, the show was cancelled and we never met all 13 ghosts. Breaking a mirror is supposed to be bad luck (or an indication that you're really ugly, according to cartoons). Carefully gather up those pieces of glass and start dying them to make your own stained glass art. There, look how easily you've turned a big superstition into something beautiful and sellable. So much for your bad luck. A lot of people have personal superstitions that are simply a thing they've always done, like holding their breath when they go through a tunnel to get a wish or covering their thumbs when they pass by a graveyard. Whatever your biggest superstition is, today is the day to conquer it. Friday the 13th is the worst time to let a superstition rule your life. You're a grown woman. You can do whatever you want. 8. Tell people on the 14th floor that they live on the 13th floor. Because of the taboo surrounding the number 13, many buildings across the country skip 13 entirely when numbering the floors they have. Just because you call it 14 doesn't mean that the floor you pass after the twelfth floor isn't the thirteenth floor. Reminding the people in 14B of that fact will help them face their superstitions just like you've faced yours — or get you banned from the next neighbor-to-neighbor party. 9. Open every umbrella indoors. Have you ever wanted to do your own personal rendition of Singin' in the Rain but have way too much pride to actually go outside and sing in the rain? Grab your umbrella and do it in your house. It won't be raining and opening an umbrella indoors is bad luck, but you'll probably have fun. You know, before all the bad luck. 10. Listen to a Taylor Swift album. Taylor Swift considers the number 13 to be her lucky number and often has it scrawled on the back of her hand during concerts. If you want to get rid of your phobia of all things Friday the 13th, try listening to her album. You'll either love it, hate it, or wish you'd done something else with your time, but you won't be scared anymore. The Omen, also known as The Omen: 666, is a horror movie about the Antichrist. 666 is probably the only number that people are more afraid of than 13, so combining them is either going to give you bad luck for years or cancel your bad luck forever. Why not take the chance? The film is also a classic. 12. Turn 13 into your lucky number. Pull a Taylor Swift and declare 13 your lucky number. Did you know that 13 is one of three only known Wilson primes and the sixth prime number? Did you know it's the age at which a Jewish boy becomes a man and has a Bar Mitzvah? Did you know it's the number of muffins in a baker's dozen? Doesn't seem so scary now, does it? 13. Remember that it's Friday. Who wastes a Friday being scared? Work or school is almost over. Stop cowering in your apartment or dorm or cubicle and go outside!